Marquee signing Craig Cook admits he was seduced by the ambition of Peterborough Panthers promoter Ged Rathbone. 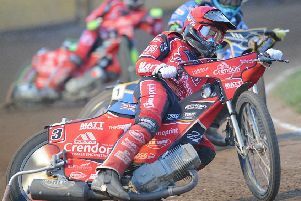 The top British star is set to make his debut for the city club on Sunday (May 22) when they entertain East Anglian rivals Ipswich in the remaining League Cup fixture (5pm). Cook’s capture has created plenty of excitement as he slots into the number one berth of a revamped Panthers septet which also now includes up-and-coming local lad Tom Stokes at reserve. And the man himself hopes to pick up from where he left off in the second tier of the sport after helping parent club Edinburgh to stack of honours in the past two seasons. Cook said: “It was immediately clear to me that Peterborough have a great promoter who really wants to take the club to the top. “I was very impressed by what Ged had to say when he first got in touch and he is just as determined to win things as I am. “I like that mentality and I’m over the moon to be a Peterborough rider. “The move is just what I need as I haven’t been getting enough racing so far this season and I’m looking forward to getting stuck into a busy schedule again. Cook is well-known to new Panthers team boss Jason Attwood after they worked together for more than two years at Belle Vue in the Elite League. Attwood is looking forward to renewing the relationship, but insists the remaining members of the Panthers team also have to pull their weight. Attwood said: “It is always brilliant to be able to bring in a big-hitter at number one, and we’ve certainly done that by signing Craig. “Myself and Craig have always got on well – on and off the track – and I know exactly what he brings to the table. “But one rider cannot win a speedway meeting on his own. We saw that the other day when Simon Stead scored a paid maximum for Sheffield, but he didn’t have the necessary support. Cook has finished second in the British Final in the past two years and he smoothly booked his place in the national showpiece again this term. He collected 10 points to advance from a semi-final at Glasgow last Sunday and will be one of the favourites for glory in the final at the National Speedway Stadium – his new home-track with Elite League club, Belle Vue – on June 13. World champion Tai Woffinden, who has pipped Cook to the crown in the last two years, is not taking part this year. Cook’s new Panthers team-mate Simon Lambert missed out when managing five points in the other semi at Scunthorpe last Friday. But captain Ulrich Ostergaard has booked his place in the Danish Final. He came through a semi at Glumso last Friday with eight points and will now challenge for glory at Holsted on June 3..